Smouldering sibling rivalry and clandestine family secrets collide to rearrange destinies in the loose adaptation of John Steinbeck's East Of Eden. James Dean's first major screen role establishes his persona as the troubled but thoughtful outsider influencing others while trying to define his place in the world. With the Great War raging in Europe, Adam Trask (Raymond Massey), an innovative California farmer, is dabbling with inventions including refrigeration to try and expand the market for his vegetables. His two sons are Aron (Richard Davalos), who seems to have everything going for him including dedicated girlfriend Abra (Julie Harris), and the outcast Cal (Dean), who doesn't seem to fit anywhere and regularly gets himself into trouble. Aron is the apple of his father's eye, while Cal and Adam can hardly have a civilized conversation. The mother of the two boys is supposed to have died a long time ago, but Cal suspects something different: he regularly travels on top of the train to the nearby coastal town of Monterey, where the popular local brothel is owned by Kate (Jo Van Fleet). Cal has figured out that Kate is his mother, having walked out on the family. Ironically, once Cal's suspicions about his mother are confirmed, his relationship with his Dad improves, and he takes on more responsibility running the farm, and starts his own side business profiting from the rising price of beans due to the war. Cal and Abra also find themselves attracted to each other, and the changing dynamics start to tear the family apart. A story of the tense undercurrents that threaten tenuous family ties, East of Eden sizzles with the taut anticipation posed by the emotional dangers lurking in Adam Trask's household. Cal is going to cause damage one way or another, and the superb variation on the ordinary is the harm caused by his unexpected transformation to relative conformity. Once Cal sorts through the issue of his mother, he finds an internal peace, but still can't avoid shaking the family's stability. 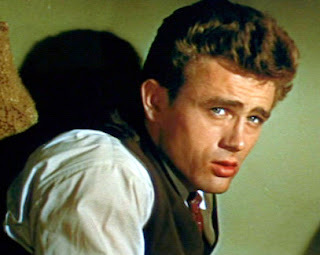 James Dean introduces the movie world to the dangerous teenager persona, caught between dependence and adulthood, clumsily questioning his surroundings and causing discomfort wherever he goes. Dean dominates the screen whenever he is on it, his presence intensely enigmatic despite a relative scarcity of words. His scenes opposite Massey, the young and the old clashing despite themselves, serve up luscious discomfort. Julie Harris as Abra is Dean's counterpoint, and demonstrates the undeniable attraction that Cal generates. 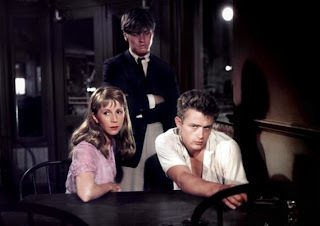 Not only does East Of Eden herald the arrival of the troubled teenager, it anticipates just how magnetic he will be: despite herself, Abra gradually detaches from the strait-laced Aron and finds common ground with Cal, the rough edges of the black sheep's mystery proving irresistible compared to the predictability of the favoured son. Harris teases out the quiet mischief in Abra with a fine performance. Director Elia Kazan and cinematographer Ted D. McCord add plenty of visual grandeur to East Of Eden, with California's landscapes, farmland, and train transportation allowed to flourish in CinemaScope. The openness of the land is held in contrast to the fragile intimacy of the threads holding Adam's family together. Familial relationships are born to evolve, and can be damaged, destroyed, or repaired. All three take place in East Of Eden, and pain or agony invariably accompany the redefinition of the ties that bind.